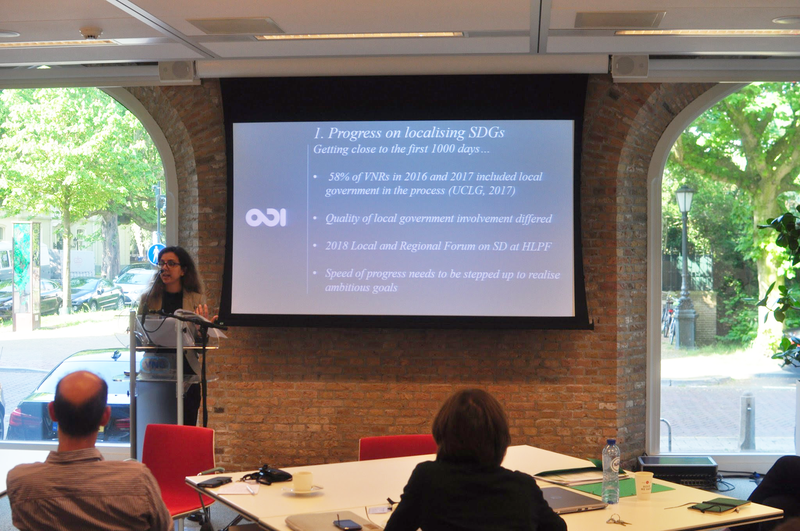 On May 23-25, 2018, the International Cooperation Agency of the Association of Netherlands Municipalities (VNG International) hosted the 13th Annual Meeting of the Development Partners Network on Decentralisation and Local Governance (DeLoG) in The Hague. The Meeting provided an opportunity for 30 participants from 19 DeLoG members and partners to discuss strategic issues on urban and territorial governance involving local governments to further the principle of Leaving No One Behind. UCLG took part in the meeting alongside other global institutional partners such as the Commonwealth Local Government Forum (CLGF), United Nations Development Programme (UNDP), United Nations Capital Development Fund (UNCDF) and the OECD. The three-day Annual Meeting was opened by Pieter Jeroense, Deputy General Director of VNG, followed by the remarks of Jelte van Wieren, Director of the Department for Stabilization and Humanitarian Affairs of the Ministry of Foreign Affairs of the Netherlands. The meeting agenda was structured in four thematic sessions: Decentralization and local governance in fragile contexts and on migration and forced displacement; Urban and territorial governance; Fiscal decentralization and local financing; Localizing the SDGs. Local government representatives’ addressed members providing strategic insights based on their experiences and lessons learned. First, Sanya K.F. Wilson, Mayor of Koboko Municipal Council (Uganda) and National Vice Chairman of the Ugandan Urban Authority Association presented first-hand information on the challenges of welcoming transnational refugees and the opportunities for social inclusion in his municipality. The Ministry of Foreign Affairs of the Netherlands also presented its approach to increase stability in conflict-affected states. The following day, Khady Dia Sarr, Programme Director for the Dakar Municipal Finance Programme, made a second keynote address providing key inputs on the innovative experience of getting ready for developing a Municipal Development Bond for the city of Dakar. Christel Alvergne, UNCDF Deputy Director, Local Development Finance, challenged the participants to re-think the localization of financing by looking at the whole financing engineering system to enhance local governments’ sustainable access to and management of financial resources. During the thematic session on Urban and territorial governance and Fiscal decentralization and local financing, the importance of Observatories to improve data and knowledge on Decentralization and Local Governance was highlighted. On one hand, Nuno Ferreira-Da-Cruz, LSE Cities, first presented the results of the global Urban Governance Survey, to which UCLG contributed together with UN-Habitat to collect key data from 127 cities. On the other hand, Isabelle Chatry, Senior Analyst at the OECD, introduced the World Observatory on Subnational Government Finance and Investment co-led by UCLG, in partnership with UNCDF, the financial support of the French Development Agency (AFD) and the Council of Europe Development Bank. DeLoG is part of the Steering Committee of the Observatory and participated in the Methodological Workshop in April. UCLG contributed presenting the outcomes of the Local and Regional Government 2017 Report to the High Level Political Forum (HLPF) as well as the preliminary results collected from Local and Regional Governments and their associations in 56 countries. Gemma Aguado, UNDP, Paula Lucci, Overseas Development Institute (ODI) and Pytrik D. Oosterhof, United Nations Department of Economic and Social Affairs (UN-DESA), discussed the topic of Localizing the SDGs with a special focus on the principle Leave No One Behind and the role of Local and Regional Governments in the reporting process of the SDGs. The Localizing the SDGs platform was presented to the members who were encouraged to share experiences and information on how the community of development cooperation agencies and donors are addressing the issues of localization and co-ownership of the local agendas through decentralization.